Towards the end of the the Billy Joel doc, we had the opportunity to interview Sting. The interview was shot at a recording studio in Malibu. The best spot we could find for sound and picture was a waiting area right in the middle of the hallway where all the recording studio doors opened up to. Luckily, it was on a day that wasn’t very busy. Sting showed up by himself on a bicycle, took a shower and we did the interview. He was really nice and was a great interview subject. It wasn’t the first time someone showed up on bike to an interview without any hoopla. 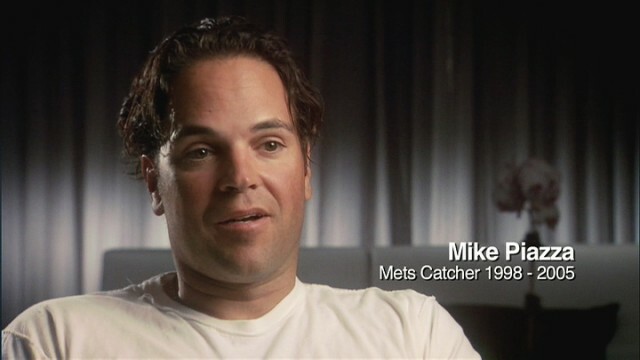 Mike Piazza, one of the few sports figures we talked to that I had actually heard of, also showed up on bicycle to the Miami hotel where we shot his interview. I’m always pleasantly surprised to meet celebrities to find out they are usually very nice to work with. Sometimes, they’re not, but for the most part they’re really cool. I usually have to laugh at how “normal” I have to act around them when inside I’m FREAKING OUT. Okay, lighting setup for both: 1K Arri openface key light with a medium Chimera soft box, placed just enough to the side to see both eyes, high enough to not be too “sidey.” A 300W fresnel on the opposite side as a kicker/backlight barndoored down to a vertical slit just to light the head and shoulders. Lastly, a 650W fresnel behind everything to light the back wall, barndoored down to create a horizontal gradation from light to dark. Easy peasy. No fill light. I rarely use it unless I absolutely have to. I try to let the ambient light from the other units bouncing off the walls do the minimal fill that I like. As noted in a previous post, we shot all the interviews with a Panasonic Varicam shooting at 720/24p with a 4×5 Tiffen Black Diffusion FX 1/2 filter. Fujinon ENG-type zoom lens.